Here is a small bag to tote around Halloween treats! Place candy inside or other delectable treats for kids and adults. You can even use this bag to hold a small Halloween surprise for your friends and family. This pattern is designed for beginners but you will need to know how to change colors in crochet. Round 1 – 7 in pattern measure 3 3/4″ in diameter. Repeat rounds 9 – 10, 2 additional times. Using photo as a guide, sew strap to bag with a yarn needle. You can also, decorate your treat bag with these Halloween appliques! 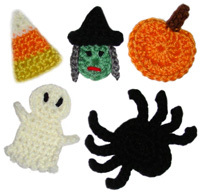 Visit the Crochet Spot Store to download the Halloween applique pattern set. If you need help crochet this Halloween treat bag, let me know by leaving a comment! 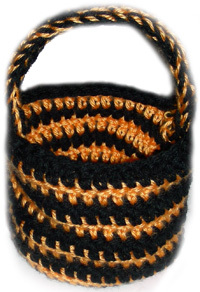 This entry was posted on Wednesday, September 30th, 2009 at 5:40 AM by Rachel Choi	and is filed under Free Crochet Patterns. You can follow any responses to this entry through the RSS 2.0 feed. You can leave a response, or trackback from your own site. I love this! I am a new Girl Scout leader this year, and I’ve been looking for something to make for my scouts for Halloween! This is perfect. Thank goodness I only have 6 scouts in my troop though! Thanks for posting the pattern. I love the Halloween bag. So cute. Thanks Rachel! Thanks Rachel ! ! ! ! Does this basket come out flat?